“Leave it to Beaver” is undoubtedly one of the most beloved sitcoms in the annals of television. Although the program focused on the lives of Ward and June Cleaver, along with their two sons Wally and Beaver, the show’s most memorable character was not any of the four principals. Despite the wholesome nature of “Leave it to Beaver,” it was a two-faced weasel named Eddie Haskell who became the figure most remembered from the series. 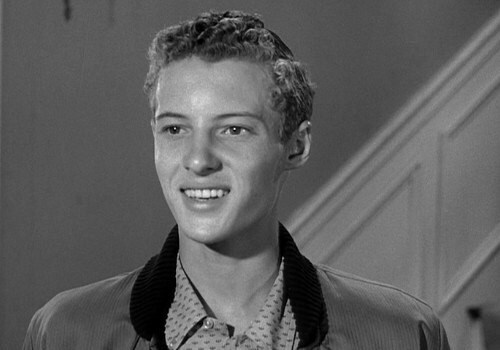 Played to perfection by Ken Osmond, just the name Eddie Haskell has become a term for insincere politeness, which he used to ingratiate himself with grownups, masking his true personality. Although equipped with several negative traits, Eddie was actually more complex, and the writers of “Leave it to Beaver” took great pains to flush out Eddie’s true nature over the course of the show’s run. Since Eddie Haskell knew better than to tangle with Wally, it was young Theodore (Beaver) who received much of Eddie’s abuse, which usually came in the form of bad advice or deliberate misinformation. In “Beaver and Chuey” Beaver befriends a young Mexican boy who knows no English. Eddie teaches Beaver a few words of Spanish, which Beaver repeats to Chuey. The resulting phrase, “You have the face of a pig,” almost sets off an international incident. In “Beaver’s Library Book,” Beaver loses the book he checked out with his dad’s library card, and is convinced by Eddie that Ward will end up in jail if the book is not returned. “Beaver the Sheepdog” saw Beaver on the receiving end of insults from a female classmate. Eddie advises Beaver to fight fire with fire, which results in Beaver reducing his tormentor to tears. Eddie usually paid for his crimes, as demonstrated in “Wally’s Weekend Job” where Eddie, jealous that Wally has secured a job at an ice-cream parlor, calls the shop and sets Wally up for a bogus delivery. Wally, in a rare fit of anger, hunts down Eddie and pours melted ice-cream under his clothes. On two other occasions, “The Hypnotist” and “A Night in the Woods,” Eddie’s attempts to run from Wally result in him taking a spill on a wet lawn, and ending up on a ledge after falling over a cliff. Aside from being deviant, Eddie Haskell’s most prevalent characteristic was his constant braggadocio. Although Eddie was obviously a middle-class resident of Mayfield, he claimed his clothes were imported, his family’s groceries were delivered, and he planned to attend M.I.T. after high school. Once, when June invited Eddie to join the Cleavers for a roast beef dinner, Eddie declined, stating that his family was having squab. Eddie was also the master of the putdown, and though his target was usually Beaver, he did manage to zing Mrs. Cleaver a few times in somewhat roundabout fashion. In telling June how nice her hair looked, Eddie added, “My mother says you must all of your time in the beauty shop.” While complementing June on her spotless kitchen, Eddie, again, quoted his mother, who speculated that the clean kitchen was probably the result of June never doing any work in it. As obnoxious as Eddie Haskell could sometimes be, viewers of “Leave it to Beaver” learned there was another side of him, and from time to time, Eddie himself would try to explain his behavior. Once, he described to Wally an incident in kindergarten where he was sent to school with a home permanent. At that point Eddie made a decision to “make the other guy feel like a goon first. Then, you don’t feel like so much of a goon.” In “Eddie Spends the Night,” he reveals to Wally and Beaver his fear of being alone, pointing out that pretending to be a big-shot doesn’t work when there is no one around. Probably Eddie Haskell’s most revealing moment of self evaluation came during an episode called “One of the Boys,” where he admitted that he really didn’t measure up too well when compared to Wally, saying, “If I don’t make a noise like a brass band, no one would ever notice me.” Eddie Haskell was a valuable asset to the writers of “Leave it to Beaver,” as many of the later season’s storylines focused on Eddie getting involved in situations that never would have worked if applied to Wally’s character. In Season 5, Eddie drops out of school, and in the sixth and final season, he leaves his parents and takes an apartment. On both occasions, Wally secretly fixes the situation, allowing Eddie to save face.